I came across an interesting news story this weekend - some stunning results from a recent study. Researchers at the University of California at San Diego have discovered that sleep-deprived teenagers are more likely to smoke marijuana. Ah, duh. My question would be which came first, the weed or the lack of sleep? But that wasn't the point of the study. Nope the point or main finding was if a teen was sleep-deprived and smoked weed then so did members of his social network. You've heard of the Kevin Bacon six degrees of separation theory? With weed, the network's even smaller. In the UCSD study the level of influence was four degrees of separation. Of course if these guys got together to buy their snack foods they could save a bundle on buying cheese doodles in bulk. But at the centre of the study was influence and influence over negative behaviour. The most popular teen in the social group could influence his friends in their behaviour, be it wacky tobacco, junk food or sleeping less than 7 hours a night. The trick now would be to substitute the negative activity with positive things. Right? In a related news story, I may have found the answer to waking up the participants in the previous study. Here in the Great White North, Health Canada plans to allow soft drink makers to increase the amount of caffeine in carbonated drinks. While the new levels would be clearly indicated on soft drink container labels, nutritionists worry people won't pay attention to them and thus might over-indulge. 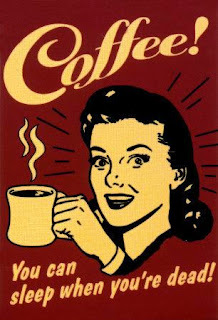 They say the higher caffeine level soft drinks could match the amount of coffee some adults drink a day. Now the rest of us just have to decide which we'd prefer. Do we want a bunch of zombie-fied, weed-induced, half-asleep teens. Or would we prefer a group of hopped-up, twitchy, bug-eyed adult wannabes? Isn't there a middle ground? Where's a survey on the effects of eating vegetables and fruit when you need one? 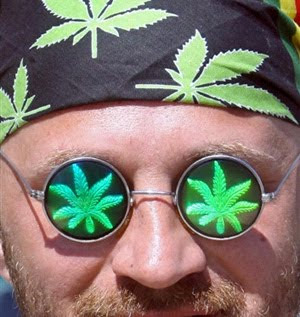 California will vote to legalize weed, I believe, in the next election. Prior to our first date I'd asked my wife if pot were legal in Canada; she was fuzzy on the details. As luck would have it, on the night of our first date we passed three youths, on Granville Island, who were taking a pot break outside a restaurant. They told me that while not absolutely legal, if a cop were to pass by he'd just ask them to put it away. Do what I do. Don't smoke weed and drink water. Okay, okay so maybe not all of the time, but I do sleep well. Especially if my roommate has some of her morphine handy. Canadian Blend: It's still illegal. But enforcement isn't up to what it should be sometimes. Don: I drink water, too. I'm just not a coffee person anymore. So the caffeine doesn't keep me awake but I have to get up five times during the night to pee! I don't know why...but as I read this post a scene from the movie "Reefer Madness" kept playing over and over in my head - a man is smoking pot and playing the piano. His playing becomes more and more frantic to where he just can't take it anymore. He eventually runs and jumps to his death out a five-story window. I dunno, sounds more like way too much caffeine more than too much reefer. Me-Me: I'm with you there. He sounds like he needs more de-caf. 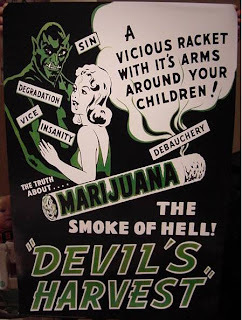 Ah... Reefer Madness! Wish I had that excuse for not sleeping as well as I used to. CL: It's effects are long-lasting. Did you smoke too much when you were younger?